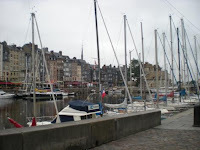 .On my travel to France, the beaches of Normandy beckoned. It is just 10 kms from the English Channel and is famous for the Battle of Normandy during WW II, when the British and Allied forces invaded France by land, sea and air, and captured the town of Caen on 9th July 1944. 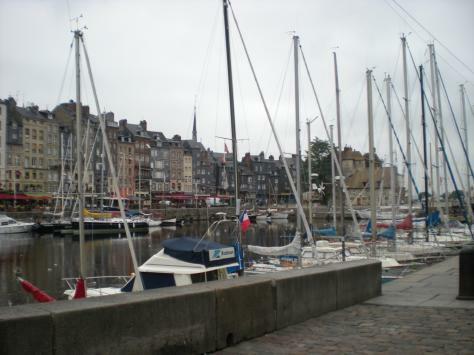 Today, Caen is totally urbanized, and is the capital of lower Normandy. “Angel of Assassination,” by the painter Alphonse de Lamartine. She was born into an aristocratic family in Orne, Normandy. As she lost her mother early in life, she was sent off to the Holy Trinity Convent in Caen along with her sister, because her father Jacques Francois de Corday could not cope with their care. Charlotte had a fine education at the convent. She had access to a well stocked library, where she became acquainted with the life and works of Plutarch, Voltaire, Rousseau and others. This might have influenced her political views in later life. After her education, she stayed with a rich cousin and eventually inherited her estates. Charlotte approved of the French Revolution and supported the Gerondists, a loose group belonging to the Jacobin Club. She called herself a ‘conservative Gerondist.’ This group consisted of lawyers, journalists, and various professionals who shared a common ideology and also nurtured political ambitions. They considered themselves ‘elite’ and were totally out of touch with the needs of the common people. Among this radical group was a journalist called Jean Paul Marat. Through his articles and newspaper, he incited people to violence. He even had twenty two of his own fellow Gerondists arrested. The irony of it was that he wrote his dangerous missives from a bath tub in which he was perpetually immersed, because of an intractable skin disease. Charlotte became disillusioned by the group, and held Marat responsible for the September Massacre. He was also indirectly responsible for the execution of Louis XVI. In 1793, when fellow Girondist Jacques Pierre Brissot denounced Marat openly, she decided that something had to be done about it. She hated violence and bloodshed and was afraid that Marat would start a civil war against the Republic. In July 1793, Charlotte left for Paris with a copy of Plutarch’s “Parallel Lives,” and checked into Hotel de Providence. Then she wrote out her message to the people of France, about the necessity of eliminating Marat. Armed with a kitchen knife having a sharp six inch blade, she set out for Marat’s house. She was denied entry even though she claimed that she had reliable information about a Girondist uprising in Caen. Undeterred, Charlotte returned that evening. This time she was allowed entry. As usual, Marat lay soaking in his bath tub. Charlotte approached with a list of some Gerondist names. As he took the paper from her, she plunged her knife into his heart. But she least expected that this would make him a martyr. But the Tribunal would not allow her to be revered for her political idealism. They declared her insane, and four days later, on the 17th of July, 1793, she was guillotined. As an insult, her decapitated head was slapped by a man called Legros. Legend has it that Charlotte turned her indignant eyes at him and bored into his soul. The man was imprisoned three months later for this act. But Charlotte was not to be forgotten. Two years later, she was hailed as a heroine who sacrificed her life to kill a monster. She has been immortalized by poets like Shelley and painters like Alphonse de Lamartine.